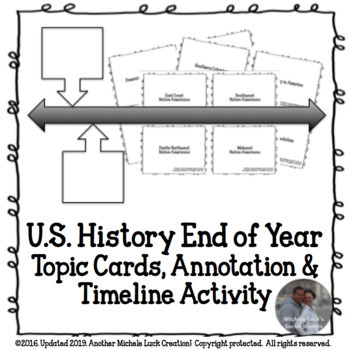 Do an End of Year Review for your United States History classes with a classroom timeline activity! 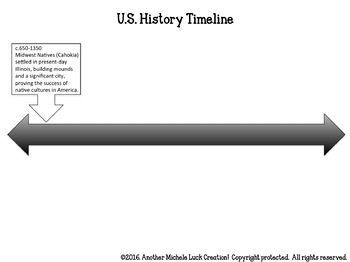 This U.S. History End of Year Review Timeline Activity covers 48 of the key topics studied in most U.S. History courses from Native Americans to Modern Day. Use this very comprehensive set as writing topic prompts, for year-end or testing review, or as discussion starters. Teacher suggestions are offered for implementation, including the creation of an Archaeology Dig and Classroom Timeline for complete course review. 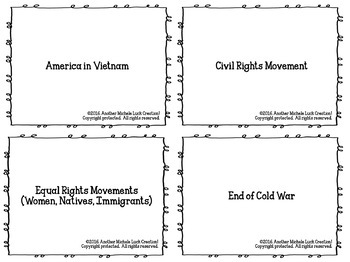 Have students dig topic cards for pair/small group review using the provided SPRITE Organizer. Orally summarize as a whole class. Create a Classroom Timeline! Also great to use at the beginning of the year, as a unit starter, or as a daily bellringer throughout the year! An answer key is not applicable since there are so many ways to use these prompt cards. Cards are arranged chronologically for timeline planning. 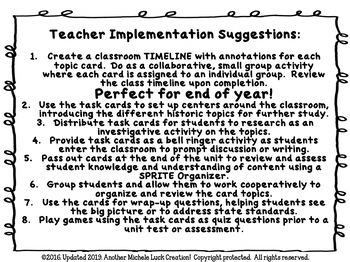 See the PREVIEW to learn if this resource will work for your students! • U.S. History Find Someone Who First Day, Review or End of Year Activity CCSS! A great accompaniment to this Task Card Review Timeline Activity is my Academic Vocabulary Graphic Organizer! Complete both activities at the beginning of the year to introduce vocabulary, or use throughout the year to reinforce vocabulary learning and connotation. You may also want to take a look at my Social Studies Classroom Poster Set. Use for a bulletin board or to reinforce Social Studies skills and graphic organizers throughout the year. My Effective Discussion Classroom Poster Set is another great addition to help make your interactive classroom one that will be beneficial for all students, teaching them valuable skills for learning. Be sure to also visit my TpT Store for great interactive resources, including everything for analyzing Primary Sources!